Moving on-craft beer is everywhere but Germany, it appears. It’s especially vibrant in Scandinavia, where brewers seem to be modeling the US West Coast scene; Italy is firmly in the Belgian camp, Spain is a nice mix of the Continent and the UK, and of course the UK is rediscovering its heritage as well as pulling from all around the New World. The beginning of craft in Germany seems firmly in the West Coast model but tempered with some German restraint. Do you see changes ahead? How long before we can see German brewers attempting Belgian Styles? I hope soon. 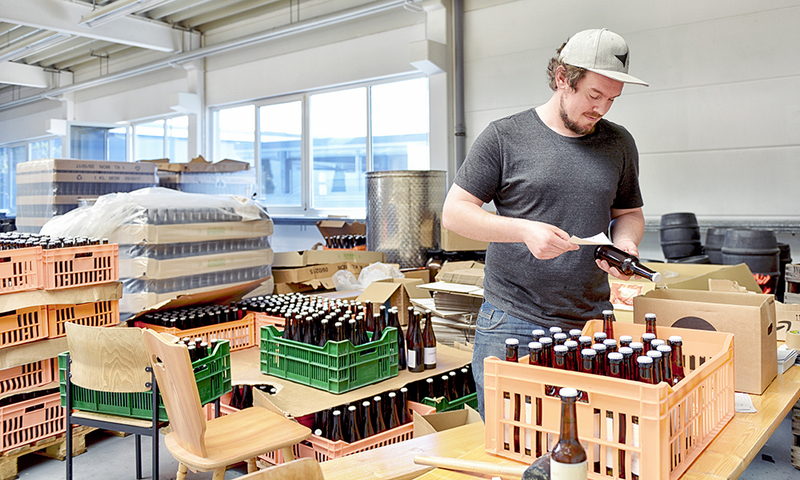 I’ve always had the feeling in Germany that craft brewers operate with one foot on the brake. It’s been said since the beginning that the German beer drinker is so used to normal lager beers that we can’t give him something with a big aroma. We have to make it low level and easy-drinking—nothing special— because he’s afraid of too much aroma or flavor. This funny because in the States, people were drinking colored yellow water and craft brewers there responded with big hoppy IPAs—the opposite—to show people that they could make something with taste. People in Germany are afraid a little bit. They don’t really experiment a lot. It’s always the same. We have to find our own style of craft beer in Germany. Goese and Berliner Weisse are gone. They’re German styles from the past but they’re more common in the States or other countries now. The same with Koelsch. 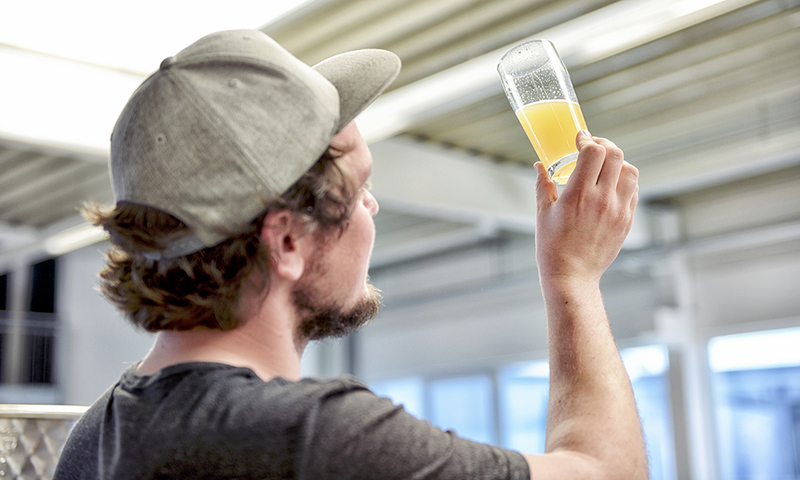 So many brewers worldwide are doing Koelsch and Pilsner-our beers, actually. A lot of German craft breweries from both the beginning and now recently are making Helles lagers or Pilsners again. In Germany we never really got far from Pilsner and we’re already going back. This is something I don’t understand. I understand why an American brewery would do a Pilsner next to sixty-five different Double IPAs. But here it’s usually five Pilsners and one double IPA. I was talking the other day in Munich with a guy in a beer shop about the imports we’re getting in Germany now. I see it is a little bit of a problem. Imports from the States, UK, Norway, or Italy-a lot of them are amazing beers; awesome beers as far as the drinking experience and quality and taste. There are bars in Berlin that have twenty beers on tap-maybe fifteen are imports. For us, it’s difficult when you see the level of craft beer internationally. A craft scene always starts small with a low budget, but you need people to support the brewery so it can get bigger, and earn more money and improve in quality. If you don’t have those loyal drinkers because they’re drinking imports and they’re drinking imports because they’re just better (because they’re older and more experienced and have more knowledge, money, etc.) it’s tough to grow and tough to find your place in the market. Some breweries say, “Well, this trend with the double IPA is now finished, so I’ll go back to Pilsner because everybody drinks Pilsner in Germany. They drink a lot of crap Pilsner, but maybe they’ll also drink my craft Pilsner.”. Will the Germans let their craft beer scene be dominated by imports and be content to instead dominate the world with cars? I think so-I think it’s a little bit like this. I was talking to other brewers in other markets in Germany and many are only looking to their local market. I try to push my beers everywhere a little bit, but also will be orienting more towards my own. But still it’s not easy. We are way behind with craft beer and craft beer culture compared with other countries because of our native beer culture. There’s no real need to have other beers in Germany. We have our industrial beers that are okay to drink-they’re not bad. There is no need to have beer from a new, smaller brewery, especially when they are more expensive. It’s really not easy. We have to experiment more and adopt other beer styles but also not forget our roots. We also have to be more export-focused, and I think that’s a big thing we’re missing out on right now in Germany. Most of the original craft brewers in Germany are still wearing their kindergarten shoes, me included. It takes a long time to grow and it’s difficult to get financing and investors. It seems like it’s definitely going to have to be a team effort, a collaborative thing, which is funny because it brings me to my next point, which is collaborations. They are increasingly popular everywhere—in North America, the UK, Europe—all over the place. There are a lot of people having a lot of fun. You rarely see this in Germany. Why do you think this is, and who would you like most to work with? Maybe we don’t like to have fun? No, really, it’s a good question. To be honest, I have no idea. It’s a little bit sad, because it helps a lot. It’s not just having fun at other places-it helps to be around other breweries and talk with other brewers. It’s good to see you’re not alone with your problems. And people like them-you can go crazy. Collaborations are always good sellers. I think it’s a very reinforcing thing, especially in a nascent beer scene like Germany’s. It’s also part of the Northwest ethos as well, the whole DIY, garage band kind of mindset-what’s good for one is good for all. But there are other reasons as well. For example, we just picked up a bottle of Parabola in Berlin, and this version was actually brewed at Boulevard because Firestone Walker under-forecasted and Boulevard had extra capacity. If you present collaboration more as a business idea like that, do you think Germans would be more amenable? Ha ha-my brewery is my brewery. My brewery is my castle. I’m the boss. It’s not like in the States, where Vinnie from Russian River can’t even finish asking another brewer, “Can I-” before being told, ”Yes, you can. My brewery is your brewery.”. I guess it’s a culture thing in Germany. “This is your thing, this is my thing. I don’t want a relationship.”, which is sad. People look more after their own businesses and don’t really care about others. I try to work with other brewers, but it’s weird for sure. In my opinion collaborations were a huge part of the success of craft beer in the US 30 years ago, why it went from a tiny scene to what it is now. You can’t do it alone versus I will do it alone or I can only do it alone? When you do it alone there are only a little islands but when you connect those islands to one another you can grow and get bigger. And from the perspective of craft beer, the enemy is industrial beer, and they’re huge and have tons of money and marketing power so you can’t do it alone. You need help to move forward. That’s why I was so excited to learn about Deutsche Kreativbrauer. Orca Brau is a member of this. It’s a brewers association and advocacy group challenging the primacy and restrictions of Germany’s infamous Reinheitsgebot. So, I think you might know what I’ll ask next. What are your thoughts on this law? Yes, that’s another side. But, you’re not technically allowed to put anything in your beer except malt, water, hops, and yeast—so no additives, no color changing chemicals, no foam stabilizers—and that’s great for a food product. When you have a beer in Germany brewed according to the Reinheitsgebot, it’s supposed to be pure nature-which is not true. And in German beers as well. Right. You are doing something against the law, and food laws are very serious. Beer is by law only those four ingredients. When I put something else in there, it’s technically not beer anymore, but it looks like beer when you have it in your glass. This is a confusing thing for the customer. Obviously, the Reinheitsgebot is confusing. It’s illogical, it’s controversial, it’s full of holes. There is no purity law for pasta making or bread-and these are food products. So it’s completely irrational. How does that directly affect you as a brewer? 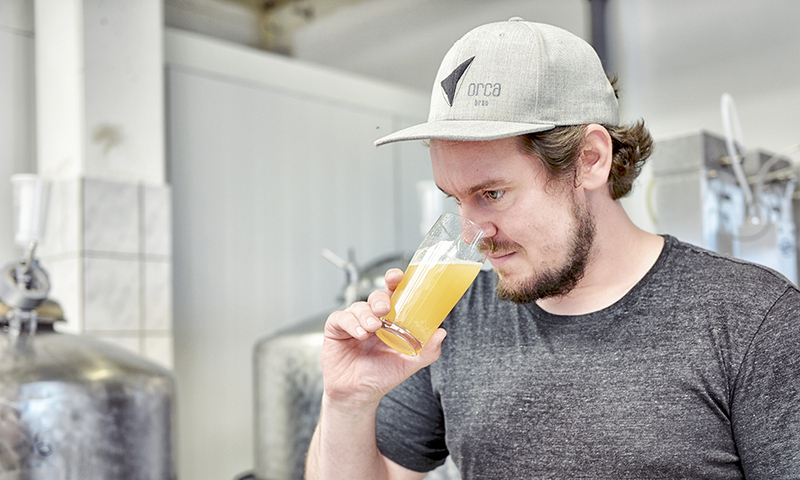 If you want a brew a Witbier, then what happens? I understand it’s different from place to place. Do you have to apply for a permit or can you just not call it beer and be on your way? Yeah. I mean if I do it, I’m breaking the law. It doesn’t matter what I put on the label. It doesn’t matter what I call it. A Witbier, brewed the traditional way, is against the law. That’s a fact. There’s no way I could get out of it if somebody came by and said this was not okay. That’s the law side of it. Of course, every law can be challenged a little bit. So we can kind-of do what we want right now. Nobody is coming with the police and saying things aren’t okay but we have to take care to not label the beer, beer. In Bavaria especially. In every other part of Germany you can apply for a permit and call it a special beer, a ‘besonderes Bier’. You have to apply two to three weeks before brew day. You have to have the recipe, you have to say why you’re going to brew this beer..
‘I want to’ is not a good enough reason? I don’t know because I’m in Bavaria and I’ve never applied for a permit. So, you’re writing two or three pages altogether and you have to fill out forms and then you send this to the Health Department and they can say yes or no. Then you get it back, the permit. Maybe not before your brew day-possibly later. So spontaneous creativity is really hampered, officially. But more and more breweries are brewing unofficially, just calling it ‘not beer’. I try to find my way around this law a little bit. So what happens, god forbid, if Bavaria just says ‘No’, and they crack down on this. I mean, you couldn’t do what you’re doing. Yeah, it’s happened here and there. There’s a brewery close to Munich called Camba Bavaria, and two years ago they brewed a Milk Stout with lactose that wasn’t allowed, even though it’s an official beer style. They have a huge brewing system—maybe 30 or 40 hectolitres— and they were ordered to pour this batch down the drain. Yeah. They used this for marketing, of course, which was a good call. But they could have also said, “No, I’m not going to throw this away. I’ll market it as Milk Stout. I have lawyers and we can go to court and let a judge decide if this is okay or not okay. And I think this is a big reason we’re not seeing very aggressive behavior by the Reinheitsgebot Polizei. If somebody takes this to court, and it goes all the way to a European Court, then the Reinheitsgebot is done. Because, in the EU, every company has to have the same rights in the market and we don’t have that with beer. But in the end, with German beer, the Reinheitsgebot-it’s such a big part of German identity, and German identity right now is a big topic. When you see the increasing popularity of the Right, especially in Bavaria, I don’t think anyone in the near future will be saying, “Okay, the Reinheitsgebot-I’ll change this” because it would be like saying, “We’re taking German beer away”, and that would be the end of everything. I wanted to talk about your labels. They’re strikingly unique and not at all German. You mentioned before that you and your wife do the art, and that your labels evolve a lot like your beers. Can you talk about your process? Well first off, we always do the labels when the beer is done. I have tons of ideas about beers. For example, I once had a Belgian Brown Ale aging for several weeks and we had a label made. The whole time I was wondering what I could do with it. I ended up infusing it with coffee, and then of course we had to make new labels. 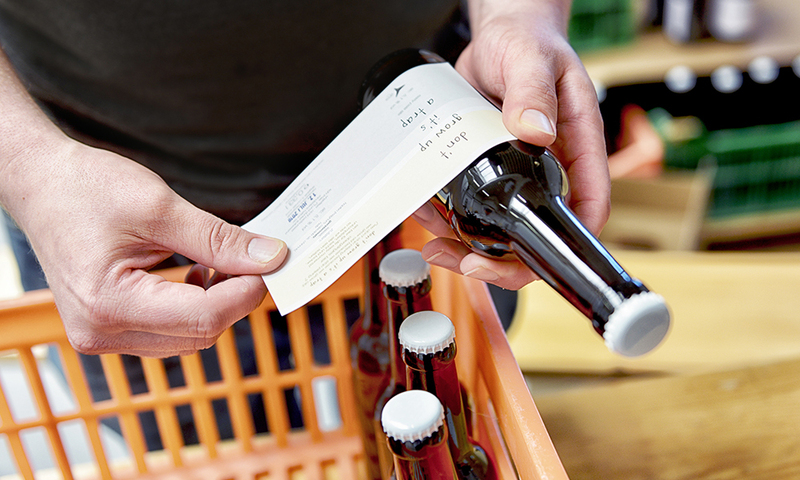 A big part of the process essentially is to match the strength or weight of the beer with the label. And we often add sayings, sentences, or phrases as well. This is a modern thing now-maybe not in Germany but in other parts of the world. My wife has a lot of fun with it, but it’s also work. She does the design work but we try to do it together. We brainstorm about the beer and flavors and see what happens in the end. They are lovely labels. I’ve certainly enjoyed everything I’ve seen, especially the names. 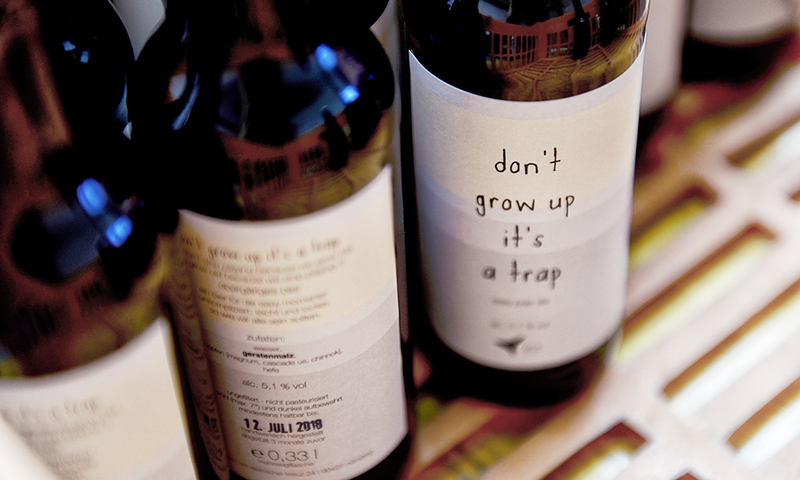 For example, we’re now drinking easy Easy Pale Ale, a rather whimsical beer name with the tagline, “Don’t grow up, it’s a trap”. This is priceless-I agree wholeheartedly. And on the back there is the blurb, “We don’t stop playing because we grow old, we grow old because we stop playing”. This is obviously not a typical Franconian label. No, not at all-we’re sort-of educating people in both beer and English. We had one beer in the beginning that was called ‘Normal’ or ‘normal’, which was the Helles lager, and ‘Einfach’, or ‘simple’ which was the Golden Ale, and ‘Anders’, which means ‘different’ in English-this was the Double Pale Ale, dry-hopped with Citra. So Normal, Einfach, and Anders-these were the first three beers that we opened with, along with the Boomshakalaka, the Smoked Raspberry Habenero Ale. People ordered the first three, no problem, but tripped over Boomshakalaka, but we could guess what they meant. I like beer names a lot-it’s one of my favorite parts of the job, choosing beer names with Suza. There seems to be great pleasure in it, great joy, in your beer names. I’ve certainly enjoyed reading through your list of past creations. Will you be creating something for Beer Yoga, if that actually becomes a thing? Last Friday was the first Beer Yoga session here. I made a beer called Lotus Land, along with the labels. This is actually a nickname for Vancouver. It’s a Pale Ale with a little wheat malt, hibiscus, and sumac. I hope to have it ready for the next yoga session. So, we’ve arrived at the end of the interview. And to close, I’m a big fan of Craft Beer and Brewing magazine and their ongoing segment called, “Pick Six”, where they ask brewers around the world for their dream six-pack or desert island six-pack. If you were walking out the door and going to a desert island, what would you be taking with you? That’s not easy, but it’s not the first time I’ve been asked this question. However, every time I’ve been asked, I’ve chosen a different six-pack. Half of the six-pack would be awesome Franconian lager beers, but they would probably be gone in under thirty minutes. I would also choose higher alcohol beers to be in a good mood and survive on the island. Is it a hot island? Is the weather warm? I had a feeling we would run into this kind of trouble, so I came with a back-up question. What’s in your fridge at the moment? A couple of my beers, for sure, and one of those crazy Omnipollo Imperial Stouts. I also always have regular lager beers in my fridge-right now I think I have Kehrwieder Kellerbier. And there’s more, but I don’t really remember. I have one Woodfour and a Berliner Weisse from Lemke. It’s always different beers. I think one of the most important things to do is try beers—lots of different kinds of beers—so you know what’s out there. Absolutely. Thanks very much for the interview Felix. It was a lot of fun, and special thanks for doing it in English.